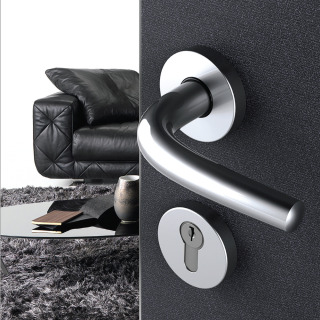 Door handle Tropex series Meran in stainless teel. The importance of the Tropex Design market comes through the use of noble and precious materials such as stainless steels. The result of different cultures, supported by experiences and innovations, Tropex Design meets the market's evolving needs, solving the challenges that contemporary technology indicates. The company offers handles and stainless steel handles 304 which, of all shapes and sizes. The evolution research, Tropex responds with the steel AISI 316L much more resistant recommended for the external environment as it assures a better resistance to corrosion. The Tropex Design solutions with longevity characteristics, environmental and health sustainability, corrosion resistance, abrasion and acidity, are widely used not only in public buildings, but also in medicine and household and food industry. The rust resistance of stainless steel is due to the fact that the components of the alloy, chromium and nickel, form an invisible passive layer. The traces of rust are caused by the so-called aerial rust, which is deposited on the chock a result of environmental factors. Handles and handles stainless steel undisputed reign to their rigidity and high hygiene, fundamental attributes to cope with countless opening and closing cycles. For environments that require strict hygiene conditions are available handles and antibacterial handles undergo specific treatments reducing bacteria 99.99%.